The purpose of this Peace Mojo is pretty simple, to bring and encourage peace around a person. Part of this is to affect the person carrying the bag. This is a simple but effective magic. I have used this myself and giving this to clients to do. Its no secret we live in a anxiety filled world. This should help calm things down as well as assist in clearing and helping with stress. 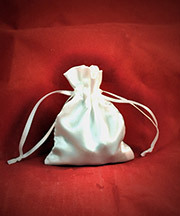 White bag ( yes I know that a red bag is sometimes used, for this it seems a white one has worked better). Mix the salt with the Lavender. Put a few drops of the peace oil in with the lavender. Stuff the bag with this mixture. I like placing a couple doves on the outside of the bag for decoration. Place a white candle down, on a white altar cloth. Relax and Breathe. Imagine a white light flowing through for a few minutes, align your chakras, or take a Cleansing Bath. Essentially, banish by your own method. Place a couple drops of Peace oil, and rub this on outside of the bag ( this is the method of feeding it). Psalm 23: 1 The LORD is my shepherd, I shall not be in want. 2 He makes me lie down in green pastures, he leads me beside quiet waters, 3 he restores my soul. He guides me in paths of righteousness for his name's sake. 4 Even though I walk through the valley of the shadow of death, I will fear no evil, for you are with me; your rod and your staff, they comfort me. 5 You prepare a table before me in the presence of my enemies. You anoint my head with oil; my cup overflows. 6 Surely goodness and love will follow me all the days of my life, and I will dwell in the house of the LORD forever. Feel, see, and hear those sensations you know as peace rushing over and flowing into into the bag. See, Feel, Hear the peace descent from above, rush into bag. Imagining these sensations streaming down from heaven is helpful. Keep repeating the Psalm 23, for 20 minutes. Do this every night, as the situation improves. Carry this with you throughout the day. Method 2: Sigil Magic approach. Of, course you, if you do not like using the psalms, this approach also works well. Place a white candle down, on a white altar cloth. Place your Mojo bag down on the cloth. Write out your intent. Usually for this It is my will that peace surrounds me. Re-arrange the letters in a way that makes a mantra that sounds enjoyable. Cup the bags in your hand and Repeat the mantra you created. Feel, see, and hear those sensations you know as peace rushing over and flowing into into the bag. See, Feel, Hear the peace descent from above, rush into bag. Keep repeating the Mantra for 20 minutes. Do this every night, as the situation improves. As this sort of a longer time building effect, you do not have to banish. Carry this with you throughout the day. I have made a few of these over the years, and although it is simple it does work. Andrieh's First Book, It will help with the Sigil Magic, and getting the energy to flow for this. Have a difficulty? Need a experienced solution generator. Andrieh combines real world coaching, metaphysics and divination to create a solution for you. Contact andriehvitimus@gmail.com to book an appointment today, or even sooner.